I now have a subscription to the Vegetarian Times. Because of that subscription, I found myself browsing their online version and came across this fast recipe for soup. I doubled the recipe in order to have enough for leftovers. In a large soup pot, saute onions in oil until soft, about 5 minutes. Toss in the garlic and cook for another minute before adding the spices. Cook for about a minute until the whole room smells amazing. In a bowl, mix 1 cup broth with the peanut butter and whisk together. Once the spices are in the pot and smelling lovely, dump in the peanut butter/broth mixture and the rest of the broth. Add the tomatoes and garbanzo beans at this time as well as salt and pepper to taste. 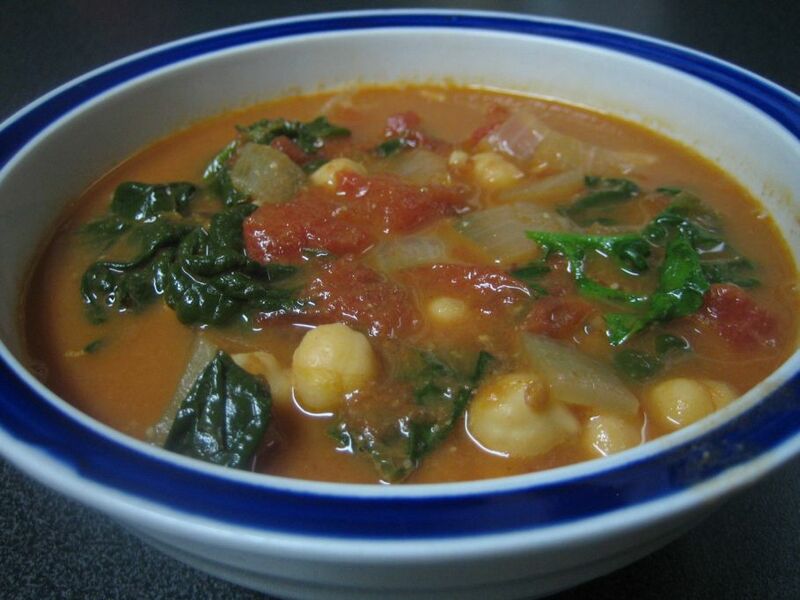 Bring to a boil and then reduce heat and simmer for 15-20 minutes, or until the chickpeas are nice and ready. Mix in the spinach just before serving. Notes: I truly love peanut butter when it’s used in soups or stews. I wouldn’t add any more than this though. The original recipe called for 1/4 cup for 2 cups broth, and that seemed a bit much to me. Also, the cayenne is a nice hint of spice but nothing to be afraid of. Overall a really great soup and, I think, one of Chris’ favorites. Every year, my co-worker Shea gets older. Older and older and older. 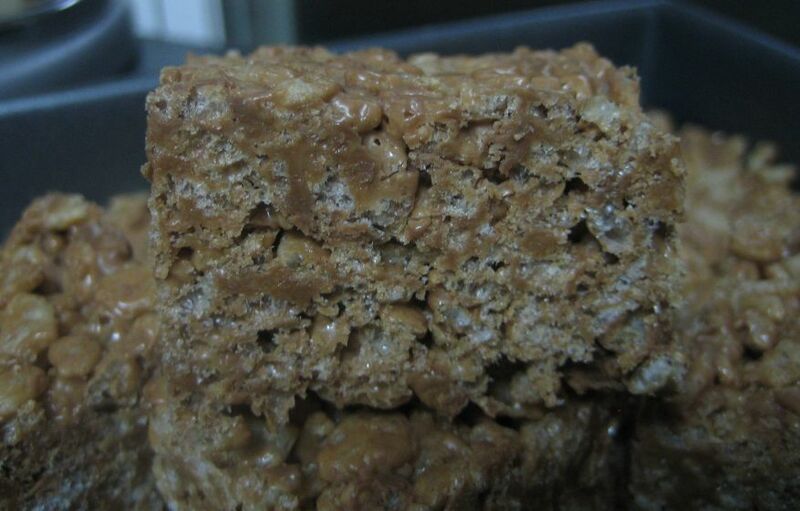 To make this annual day a little less painful, I’ve been making her these lovely birthday bars. The ingredient list is 3 items long and it took me about 5 minutes to make yesterday, so yeah. This is easy. In a large bowl, open all the Milky Way candy bars and place in the bowl. Cut up the butter and toss in as well. Melt in the microwave for about 3 minutes total, stirring every minute or so. It’s done when it’s all melted together. Dump in cereal and stir. Now pour mixture into a square dish and mash down. Let cool and cut and eat. Done. For Emily’s annual Oscars party, I brought over this double tomato bruschetta. I found the original recipe on Allrecipes, but cut down on the oil and used cream of balsamic instead. Dice the fresh tomatoes and the sun-dried tomatoes and mix in a bowl. Mince the garlic and add along with the oil and balsamic. Thinly slice the basil and toss in with the salt and pepper. Stir to combine and serve with toasted pieces of French bread. I sliced mine and place directly on the oven rack for about 5 minutes at 350. Notes: The original recipe also called for shredded mozzarella on top to be melted at the end. I didn’t want to add it as I really didn’t think it was needed and would take away from the flavor of the tomatoes and balsamic. Servings: A bunch. 9-10 people ate at least one or two pieces a person and there was some left over at the end of the night. Let’s all thank Matt real quick. “Thanks Matt!” He helped me frame this lovely shot of the pasta I made last night and it was the best picture of the bunch. 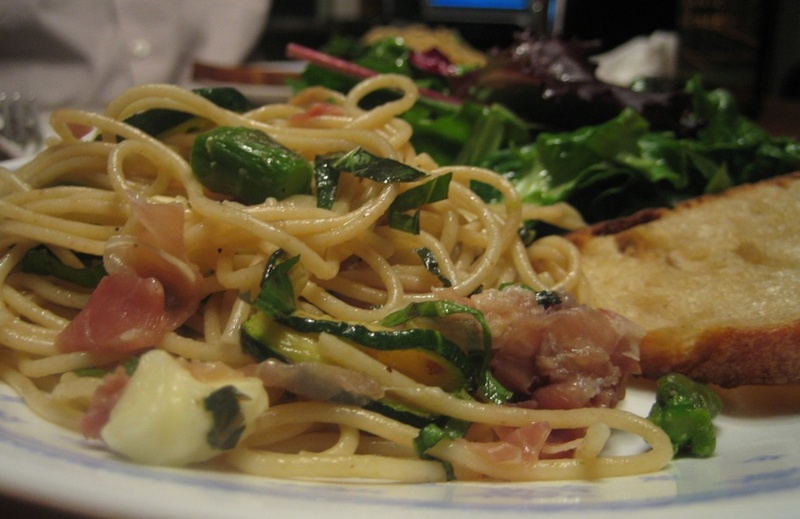 The pasta was nice and flavorful without a heavy sauce. I saw Giada make it the other day and added zucchini to my dish. I served the pasta with some sourdough garlic bread and a fresh herb salad with a lemon vinaigrette. Start by trimming the asparagus and boiling for 2-3 minutes. Take out of the pot and move to a bowl of ice water to stop the cooling. Let sit in the ice water for several minutes until asparagus is cool. Start a big pot of water and bring to a boil. Toss in salt and then the spaghetti and cook al dente. While the pasta is cooking, heat oil in a pan and toss in the garlic and diced up asparagus. Saute for a few minutes with a little salt. In another pan, cook the zucchini slices until brown on each side with just a little spray of oil. Set aside. Slice prosciutto into thin strips. Thinly slice the basil as well. Once the pasta is done, combine in a big bowl with zucchini, asparagus, garlic and oil, mozzarella, prosciutto and basil. Toss with a little salt and pepper and a little extra oil to taste. Serve warm. Notes: I enjoyed this pasta and the lack of sauce. Everyone loves asparagus too. We talked about this too. I wanted to buy a rotisserie chicken the other day. So I did. But before I bought the rotisserie chicken, I looked up some good recipe ideas. I’ve made a chicken curry salad before using a rotisserie chicken, but I wasn’t in the mood for that. I stumbled upon mole chicken tacos. So easy and I knew that Harvestime had mole paste. This was really good and quite easy. Take the skin off the chicken and shred the meat well, set aside. In a pot, heat the broth and the mole paste and whisk together. Once it starts to boil, mix in the shredded chicken and turn the heat down to simmer. Cook for 10 minutes to warm and thicken. Warm two tortilla shells and top with a little mole chicken. 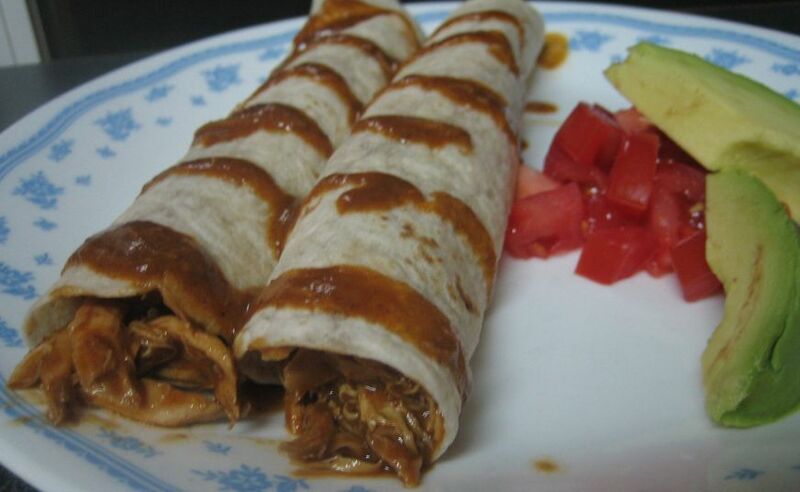 Wrap tightly and drizzle a little sauce on top. Eat with avocado and tomatoes. Notes: Weirdly, we had roasted cauliflower soup before having these tacos. Both were good, but don’t really go together. We’re weird like that. Let’s talk about cauliflower. It’s low in fat, high in fiber and Wikipedia tells me it has anti-cancer agents of some sort. Hurray! I eat cauliflower raw, but it’s much better roasted and seasoned well. This soup gave off a lovely roasted smell and taste (from the cauliflower, garlic and onion that are roasted together). 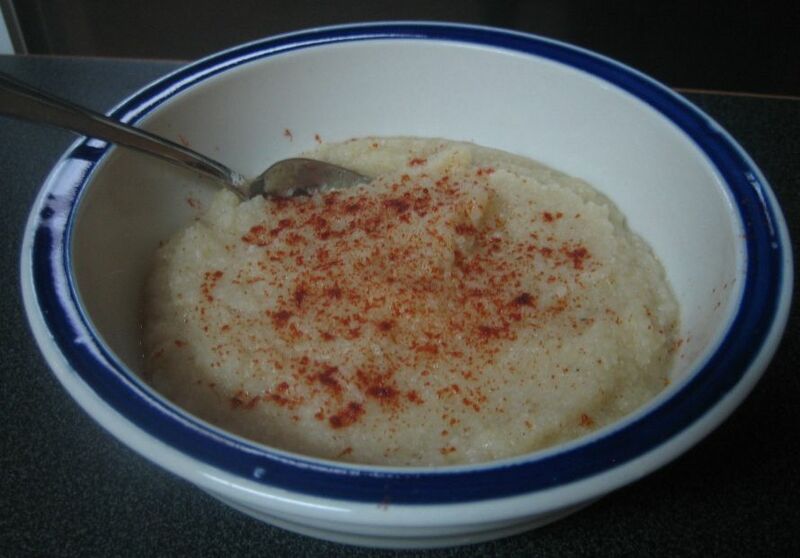 I’ve had this recipe on my ‘list of things to cook’ since it was posted on Fat Free Vegan Kitchen. Clearly her soup is much prettier than mine, but she used orange cauliflower and they don’t carry that sort of thing at Harvestime. And, you know, her camera is about 10 million times better than mine. Chop up cauliflower into pieces and rinse. Place on a lightly sprayed (in olive oil) cookie sheet and spray a little more oil on top. Bake at 400 degrees for 20 minutes. Flip each piece of cauliflower and add the onion wedges and garlic. Cook for another 20-25 minutes. While cauliflower is roasting, heat the broth and the cubbed potatoes to a boil and then reduce heat to simmer. Simmer to cook the potatoes while the vegetables are roasting. Once vegetables are done, mix into the pot with the broth and potatoes. Carefully blend the mixture until smooth and creamy. I used a food processor but in this case a blender would get it to a smoother consistency. Add back to the pot and mix in salt, pepper and nutmeg. When ready to eat, garnish with paprika. Notes: Having a bowl of soup before the main dinner is very nice. And I’m looking forward to my leftovers for lunch today too. Next time I’d like to seek out an orange cauliflower, because it looks pretty. On Tuesday night, after going to Harvestime to find it CLOSED due to a broken water heater, I had to try to find something to eat with our nearly empty fridge. 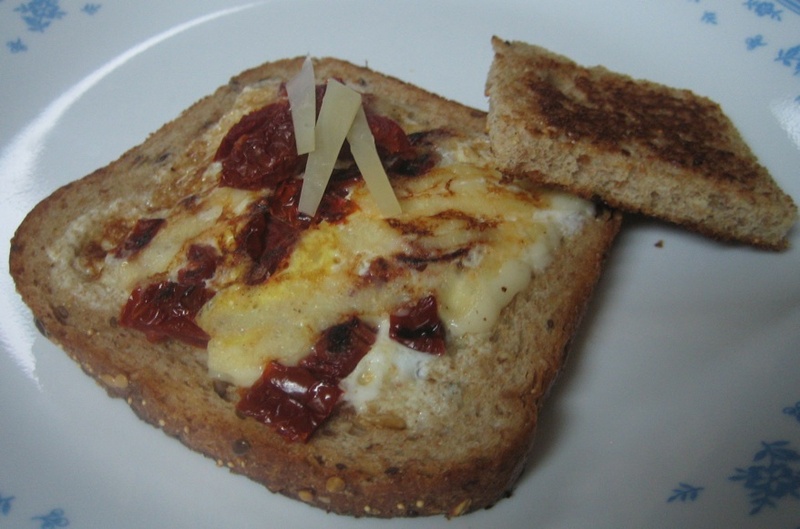 We had two eggs, some sun-dried tomatoes, parmesean cheese and bread. I threw together these ‘snake eyes’ (which is what I grew up calling them). I added the tomatoes and cheese to make it a bit more flavorful. Heat up a non stick pan and heat up the sun-dried tomatoes. Take tomatoes off the pan after a few minutes. Take the two pieces of bread and cut out the center, either with a cookie cutter or just a knife, which is what I did. Butter one side of each piece of bread and put on the hot pan. Crack one egg into each piece of bread. Top with tomatoes and cheese and cook on that side for a few minutes. Butter top side of bread (and the two pieces you’ve cut out) and flip. I also sear up the little pieces of bread with a little butter, because it tastes good. Cook until the egg is done. Eat! Notes: Fast and easy and the tomatoes and cheese add a nice flavor.